If you have followed this blog and/or our company websites for awhile, you know that it is a goal of ours to constantly evolve and improve our websites. We want our websites to be (among other things) interesting, informative, inspiring, and entertaining. In pursuit of that goal, at the beginning of this month. 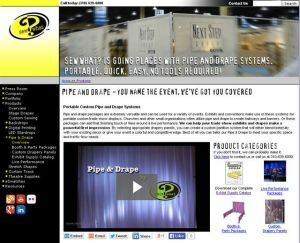 we launched a redesigned the Pipe and Drape Systems Page on the Sew What? website. Included in the revamp of the page are: brief, easy-to-understand information on pipe and drape, links to more detailed information along with our Exhibit Supply Catalog, a number of inspirational photos showing our pipe and drape in use, and much more. The best addition to the page (in my opinion)? A fantastic new video that not only demonstrates how easy it is to setup pipe and drape, but also features a wide range of project photos to show you that pipe and drape isn’t just for trade shows anymore! So whether you are designing a single trade show booth for your small business, a huge special event filling several ballrooms, or anything in between – we hope our new Pipe and Drape Systems web page helps you in the process.